How do new things come about in biology? Darwin’s theory of natural selection explains what happens once innovations arise—to preserve and propagate those adaptations that are helpful. But it doesn’t tell us how those innovations come to be in the first place. In the absence of a good explanation, we’ve defaulted to attributing evolutionary change to random trial and error. Even Darwin acknowledged that accident was not a very satisfying answer. Andreas Wagner, an evolutionary biologist at the University of Zurich and External Fellow at the Santa Fe Institute, is working at the leading edge of what can rightly be called a revolution in scientific thinking. Integrating recent knowledge about the behavior of molecules and the existence of vast genetic networks with more traditional Darwinian thinking, this work shows how adaptations are not driven by chance, but rather by a set of laws. These laws operate at the most fundamental level, and can be understood to drive ancient innovations such as photosynthesis as well as much more modern ones, like the proteins that allow certain fish to survive in the killing cold of Arctic waters. Examples of biological creativity are all around us. 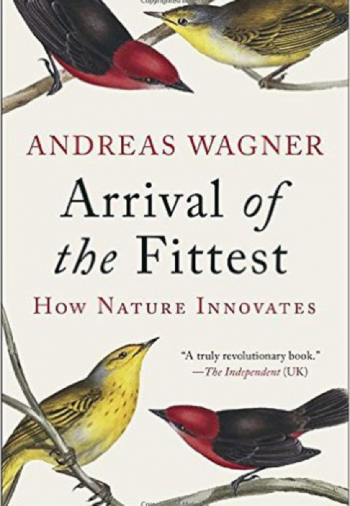 Arrival of the Fittest: The Hidden Mechanism of Evolution, offers a striking new account of where those innovations in nature come from, and what they can tell us about human creativity as well. This provocative and original work begins to answer some of evolution’s oldest questions. A book of startling congruencies, insightful flashes and an artful enthusiasm that delivers knowledge from the inorganic page to our organic brains. Arrival of the Fittest will give you a new appreciation of the sheer improbability, but also the plausibility, of the diversity of life. This well-written, clear analysis of current research will be of interest to those who want a better understanding of the mechanisms of evolution. Arrival of the Fittest contains brand-new scientific insights told in sparkling literary prose. It is a landmark book that combines original, perhaps revolutionary ideas elegantly explained. In particular, the concept of genotype networks—that there are thousands of ways to alter a metabolic pathway without stopping it from working—promises to solve the enduring puzzle of how natural selection can be such a force for innovation.